Henry Winkler and Bill Hader. This Sunday, HBO will unveil Barry, an ambitiously dark series centered on a sullen hit man (Bill Hader) who’s grown weary of his profession, and is awoken artistically when he poses as an aspiring actor in a Los Angeles theater class. Born in the minds of Hader (its star, producer, and director) and Alec Berg (a writer and producer for Seinfeld, Curb Your Enthusiasm, and Silicon Valley), Barry seeks an answer to a central question: What happens when the thing you’re good at is no longer the thing you want to do? 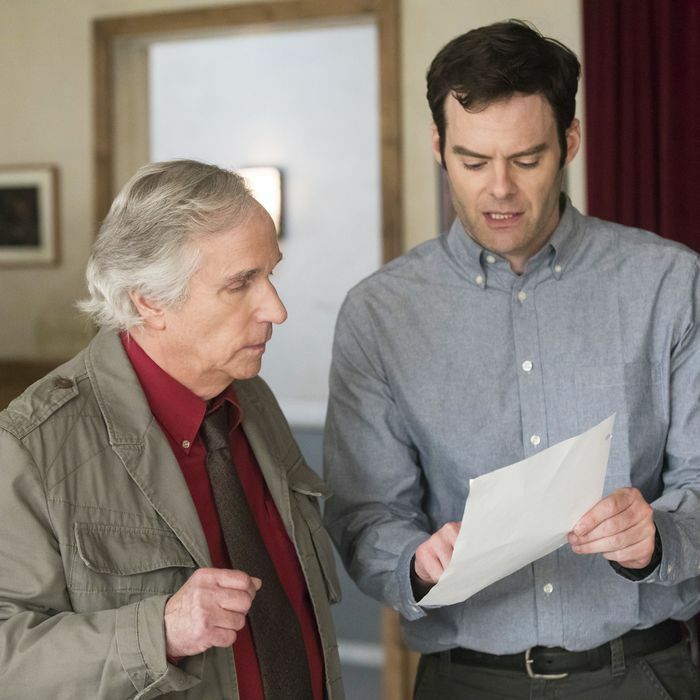 Vulture sat down with Hader, Berg, and co-star Henry Winkler in Pasadena last January to discuss how Barry was loosely inspired by Hader’s struggle with performance anxiety during his eight-year tenure on Saturday Night Live, the “fascinating” teacher-student dynamics they witnessed while researching acting classes in L.A., how it felt for Hader to read with Winkler during the latter’s audition, and why SNL creator and executive producer Lorne Michaels wasn’t exactly impressed to learn that Hader learned a lot about making TV from the NBC sketch series. Henry isn’t here yet. Should we wait? Bill Hader: That won’t stop him from telling more stories about playing Fonzie. We get it. I’ve seen the leather jacket. It’s on display at the Smithsonian. While we wait, I’ll ask you, Bill: Was a half-hour HBO comedy what you envisioned for your post-SNL career? Hader: I didn’t know. The pressure of SNL really gets to you after a while, and you just know it’s time to go. I only knew I wanted to move to L.A. Then I did Trainwreck. Also The Skeleton Twins, which was more dramatic. So you waltzed into HBO and got everything you wanted. Hader: [Laughs.] Exactly. That’s how things always work for me. [Henry Winkler enters the room.] Hey, there he is! How are you? Henry Winkler: I’m happy to see you. Hader: We’re kind of mid-interview here, Henry. She just asked me a bunch of crazy questions. So anyway, I was in my meeting with HBO. Winkler: What are you talking about? Hader: We’re sitting in the Alec Berg Wing of HBO right now. Berg: Ah, that’s where all the money went. We’ve seen that a few times. Berg: One thing I thought was really interesting was that Bill was incredibly good at the comedy on SNL, but he found it to be very stressful. Hader: I had very bad anxiety about being onstage. I also didn’t like the live aspect of the show. In retrospect, a show called Saturday Night Live wasn’t a natural fit. Hader: [Laughs.] I couldn’t handle it. But that’s what happened. Berg: You were sort of a prisoner of your own gift, and we thought that was an interesting angle for Barry. What if somebody was really good at something he hated, and desperately wanted to do something else that he might be terrible at? How did you choose a Los Angeles acting class as Barry’s venue for self-discovery? Hader: We went to some classes to research — I’d personally never taken a formal acting class, mostly just improv training — and we were struck by how much it felt like group therapy. We decided, Okay, Barry can realize things about himself through theater. The first time we see Henry’s acting teacher, Cousineau, he is berating a female student to the point of tears. Did you witness a scene like this in real life? Berg: Basically. An instructor emotionally battered a woman and she started sobbing. But by the end of it, she was incredibly thankful. “Thank you so much!” It was like Stockholm syndrome. We thought, This is fascinating. One of the funniest moments in the first episode is when Barry and his intended target, Ryan Madison, perform the showdown scene from True Romance. Hader: We actually saw that performed in an acting class. Henry, in all your years as an actor, have you ever witnessed this aggressive approach to teaching? Hader: It’d be good if you cried for once, Henry. Hader: That thing about the garden is actually in episode three of our show, but instead your character says, “Go into a grocery store, what can you see?” And Barry has no imagination whatsoever. I love the name of the book that Henry’s character has written about acting: Hit Your Mark and Say Your Lines. Winkler: I wanna say one thing — these guys are geniuses. I have used the word genius before about them. It is true. Bill and Alec, is this level of adoration uncomfortable for you? Hader: Not at all. Sounds great to me, Henry. Winkler: And I’m not done. This show is like putting on a cashmere sweater that’s on fire. It’s a magic that doesn’t happen out of thin air. There is no amount of work that you can do to make it exist if it doesn’t. Hader: You sweet little thing. Bill, what was it like directing yourself in the first three episodes? Hader: Not easy at all. [Co-star] Stephen Root told me that when we were doing his coverage, I was mouthing his lines. I felt so bad. And Sarah Goldberg said when we were doing a scene together, I would kind of flinch and make a face. She was like, “Is he doing that in character or as the director?” Overall, it was very hard, but I’d always wanted to do it. And we prepped a lot. Winkler: These guys do this stuff effortlessly. They know exactly what they want, which, for an actor, is … I can’t begin to tell you how important. At the same time, they are totally open. And just for my own ego — I’ve seen only the first episode so far — they let me ad-lib a line and they used it! Hader: In episode six, you get a good ad-lib, too! Bill, did you improv in your performance? Hader: Not really because this story has what I like to call a narrative propulsion to it. By the way, I’ve been using that phrase a lot. [Laughs.] In such tight, 30-minute episodes, I really couldn’t. But there were certain scenes where we could let the actors kind of go nuts. Berg: It’s tricky because if you do a lot of improv, it forces you into more cross-coverage and flatter lighting. Hader: Yeah, you might have to do it that way if you want the actors to be able to improvise a lot. And all these actors brought something to the roles that we weren’t expecting. Henry, this is your first project for HBO. Does your veteran status allow you to relax a bit on set or did this feel like starting over? Berg: I was out of my mind when I heard that. So what you’re saying is that actors make terrible bosses. Winkler: I was nervous. Then I see out of the corner of my eye that I’m making Bill laugh. And Alec is sitting on the couch smiling. I’m thinking, Oh my God, I’ve made Bill Hader laugh and Alec Berg smile. Hader: To make Alec show any sort of emotion is incredible. Winkler: And then I go home, and wait and wait and wait. I’m convinced they’ve gone with Robert De Niro. Bill calls and says, “Hey, how are you? I wrote two scenes last night.” I said, “No kidding, that’s great.” “Can I send them to you? You wanna come in again and play?” In my mind I’m going, No, I really don’t wanna come in again and play. Winkler: “I don’t know if I can do this again!” So I send the scene to my son, [director] Max [Winkler], and he directs me on the phone. “Dad, you wanna say the lines the way they’re written. You have to respect the writing. I believe you can pause right there. Okay, let’s do it again.” And I went in again. And here I am today, sitting on the couch with these two guys. A really happy ending. Bill, how much relief do you feel not having to be part of SNL, now that it lives and dies by political news? Hader: A lot. But it really mostly was the live aspect of the show I never got used to. It really never got easier, even after eight seasons? It really is boot camp.